Remember this yummy cheese tart? I made it again yesterday and I really have to recommend this recipe. It’s really fast and fool-proof (remember last time I forgot to pre-bake the crust and it still turned out well, and I never seem to find the time to chill the dough before baking it) and so so so yummy. It would make a great starter for a full dinner, and it made a really great light summery dinner for us this weekend. Click past the break to get the recipe! 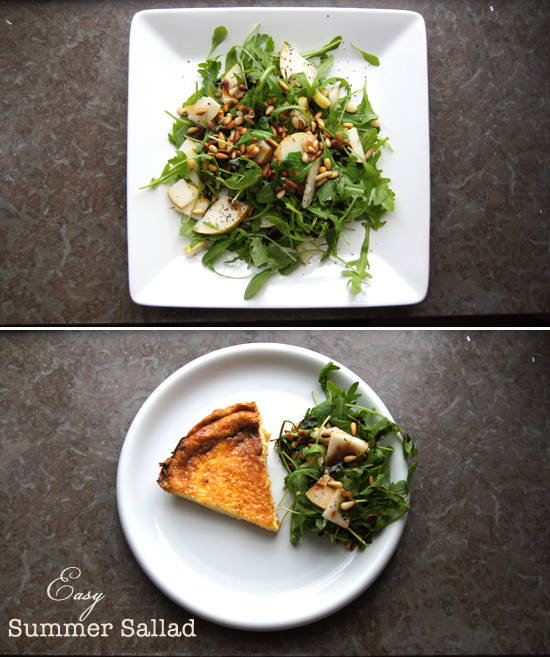 This time I served it up with a light fresh salad made of just arugula (the peppery taste is a perfect complement to the tart), thinly sliced pear, roasted pine nuts (walnuts would also be great on this), olive oil, salt and pepper and creme di balsamico (balsamic reduction/syrup). You could add avocado to make it more filling. Delicious!